This Linen Ribbon with a Eyelet Pattern & Wired Edge is an exciting trend for decorating this holiday season. Ideal for decorating projects that need a pizzazz! 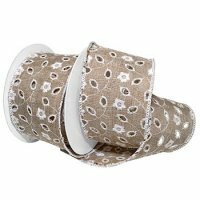 The Ribbon Diva offers an extensive collection of Morex ribbons are used throughout the gift floral, craft and packaging industries.